A high fibre paste formulation for rabbits and small pets. Fibreplex for Rabbits provides palatable, easy to administer extra dietary fibre to encourage normal hind gut function. Includes beneficial micro-organisms to rapidly populate the gastrointestinal tract and prebiotics to synergistically enhance the growth and colonisation of beneficial micro-organisms. The prebiotic Preplex combines multi-sources of prebiotic to ensure various degrees of selectively fermentable sources of food for beneficial micro-organisms within the gut. 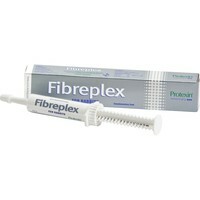 Use: 1ml of Fibre plex per kg of weight, 3 times a day for 1 to 2 days. My lop has problems with gas and the vet recommended this to help the friendly bacteria in his gut. Its much cheaper buying it online fairly regularly than to keep paying for consultations & get this through the vets. Only downside is he hates taking it so I've resorted to smearing a blob on a small bit of digestive biscuit which seems to be the only way to get him to take it and tolerate it. My grumpy (and uninsured) old lady of a bun is prone to gut stasis. I keep this on hand and pull it out at the first sign of low appetite to stimulate her gut and hopefully avoid a stressful (and expensive) vet visit. She's a very picky eater at the best of times, and virtually spits out the stuff I get from the vet. This she takes fairly happily. It's very easy to administer, with a nice long nozzle for getting behind the teeth of even the most determined bun (and mine is). Dosing is simple; 1ml per kilo, turn the clever screw mechanism to the right number, then it prevents you from pushing the plunger too far and giving too much. In a word; brilliant. Very occasionally my bunnies go off their food usually when stressed. I used to have to take them to the vet to get this product costing me £25 for a check up and £15 for this item. Now I can buy this online for a fraction of the cost and the bunnies aren't stressed out by an unnecessary vet visit. This keeps their digestive system moving and I know if they don't improve by the next day that I really do need to take them to the vet. This is really the best way of getting food into a stubborn rabbit when they won't eat. Simple to calculate the amount, very quick to use and no mess. Successfully used on both my bunnies. An essential food supplement to keep on hand for rabbits prone to gut problems. This is brilliant stuff if you have a guinea pig not eating after operation or on medication. Usually one 1ml dose puts them back on track. Fibreplex is an excellent product, I always give along side antibiotics as Guinea pig's have such sensitive guts really helps restore the gut flora. This is a great product. Bubbles, my 8 year old rabbit, loves the taste of it. He is a very fussy eater but once he sees the tube he runs over and licks it. It is great for older rabbits and can be given directly from the tube or syringed into a banana.